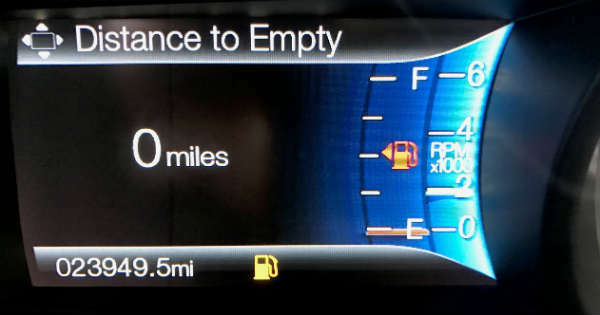 How Far Can You DRIVE On A 0-Miles To EMPTY FUEL TANK? - Muscle Cars Zone! How Far Can You DRIVE On A 0-Miles To EMPTY FUEL TANK? While running a few errands, AutoVlog noticed that he has about 4 miles to empty fuel tank. So he thought why not do a little experiment and see how far you can drive until you run out of gas. He plans to go down to about 0 miles to empty and see how far he can drive on that. Obviously it`s going to vary from car to car so keep in mind that he does this with a Ford Fusion that has a 4V engine. He is also doing this under cold weather conditions. That should affect this experiment as well. Once his car hits zero miles to empty, he is going to reset the trip meter so we can actually see in real time how many miles he can drive till it runs out of gas. You will be actually amazed at how much you can drive with zero miles to empty fuel tank. With a Ford Fusion at least. He managed to drive approximately 21.6 miles on a zero miles to empty. So, you should be able to drive at least 15 miles with any car on zero to empty. Did you find this informative? Let us know in the comment section below. At last, here are some gasoline tricks you could use when at the pump station!